China has experienced an increasing number of strikes in the last few years. Among them, the Walmart workers’ protest that is now in its third month marks a new stage in post-Mao labour history. The protest exhibits a number of special features. First, while all of the strikes so far have taken place at single workplaces, coordinated strikes erupted at the same time this year at four Walmart stores in different cities. Second, these strikes, as well as protests at many other Walmart stores, were initiated and organized by workers themselves without prior contact with any labour NGOs. Third, the protests have been coordinated through the internet, using an on-line platform set up by two Chinese Walmart workers in 2014, The founders gave it a low-key benign name “Walmart China Workers’ Association” (WCWA). The two men serve as coordinators of blogs and chat rooms, with the intention of providing a platform for workers to exchange information, particularly on legal knowledge. The internet discussions have given workers a sense of collective identity as Walmart workers. Though the network does not have any formal organizational structure, it is has become a powerful organizing tool. A question has to be asked: why is it that since almost all Chinese workers now have mobile phones, other protests and strikes in China tend to take place at single workplaces. The difference is that Walmart workers have an unusual sense of common identity since the problems they face at Walmart stores are very similar to the minutest details. This identity is a product of Walmart’s unique corporate structure and management method and style. Walmart through the years has always tried to build up a personality cult around its founder, Sam Walton. All stores have the same organization structure, the same number of hierarchical levels, the same rules and regulations, all workers are given an English name, and they all have to scream the same Walmart Cheer in unison every day and have the same message drummed into them they are “Walmart persons.” (沃爾瑪人). Even though many of the workers harbour a host of grievances against the company’s authoritarian management practices and low wages, they do think of themselves as Walmart workers. Walmart’s socialization process works, though not in the way Walmart would like it. This Walmart identity is also found in the United States. The American Walmart workers who organize themselves in a protest group call their association “Our Walmart”. In China, WCWA members have all shared similar experiences and speak the same Walmart language. What sparked the Walmart strikes is a new company policy. In mid-May Walmart announced that it was going to use a “generalized work hour system”, which is very similar to American Walmart’s “open work hour system.” This allows extreme work hour flexibility. The Chinese Walmart workers were mortified. This would mean regular work hours are thrown out of the window and workers have to come to work anytime on call. Suddenly WCWA’s membership jumped to 10,000.
the ACFTU publicized what it had done and demanded that, under Chinese law, Walmart must accept the union branches, Walmart cut a deal with the ACFTU. A memorandum of understanding (MOU) was signed with Walmart to set up union branches in all of Walmart’s 100-plus stores with Walmart’s active participation. Since then, Walmart union branches have been staffed by Walmart human resource (HR) managers. Nevertheless, the initial 2006 spate of democratic union-branch elections had unintended consequences. Workers who had participated in those elections and are still working in Walmart stores want to get back their union. Not surprisingly, the main labour activists today in the WCWA are in their mid-forties. Other Walmart workers know that their own stores have union branches and they have some idea about trade unionism, even if their branches are being chaired by Walmart’s managerial staff. As wages and work conditions declined at Walmart, a few of them have tried to run for union election. Walmart management, with the tacit support of the official local unions, put all types of obstacles in their way. In its campaign WCWA is very insistent in pursuing the ACFTU at national, provincial and city levels to support them in the fight against Walmart, because ten years ago they had helped workers set up democratic workplace union branches. 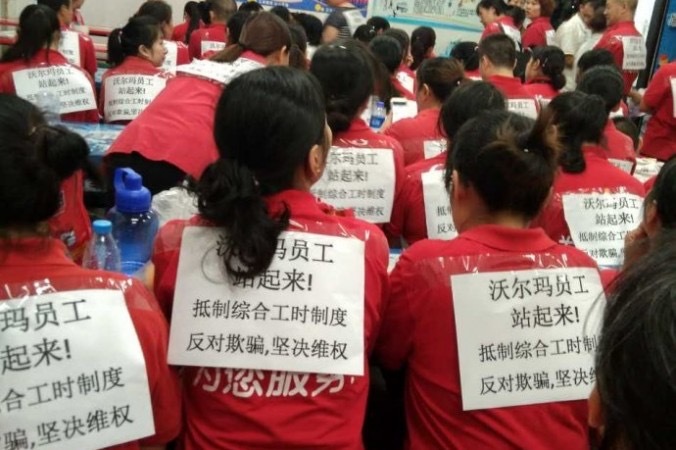 Pressured by the WCWA, People’s Daily and the Guangdong Provincial Trade Union announced that retailers such as Walmart are not eligible to use the comprehensive working hour system. But district-level trade unions and labour inspection offices continue to ignore these announcements. This is because in the Chinese political structure, their real superior is the local government, which is interested in attracting foreign investments and thus colludes with factory owners. But the two announcements gave the Walmart workers’ struggle legitimacy. Right now the activist workers are bringing their cases to court. WCWA is calling on the international labour community to support them in fighting this battle.